I expect to move it to secure site at the beginning of January 2013 for work to start virtually straight away. 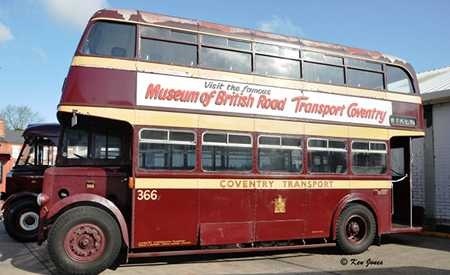 It is coming to me on a 20 year loan and I have agreed a remedial plan with Coventry Transport Museum. Major issues are the cracked block on the engine and the seats which require re-trimming. The list of work however is quite extensive and cost estimated at a range between £50k and £80k + volunteer hours; depending on what we find on wiring and structure. Visual issues for consideration are the downstairs windows and whether we keep what is on already (know they are not right) against finding other suitable ones to replace. Knackered Roe bodies are however few and far between; and of course trim material for the seats. Believe in 1951 it was trimmed with Lister check moquette like 126-165 and the nearest material to that is London Transport check. The hydraulic brakes will require overhaul including refurbished master cylinders and of course £2k for new tyres flaps. 366 was withdrawn from service in 1959 but retained by the maintenance department as a mobile workshop with fleet number 02. The platform door was panelled in as were the lower deck windows. It was little used as such but in 1970 was passed to the Transport Museum, the door was reinstated and replacement windows were fitted. The number 366 was affixed in addition to 02. Now restored and in beautiful condition. Seats fantastic and it certainly motors well. I managed rides at both Quorn and Aldridge. Shows how optimistic I was saying 2014 when in fact it became 2018. We lost a whole year due to issues getting the downstairs window frames fabricated replacing the Orion windows in the picture. I overlooked I would need new window cappings for the inside of the frame as well. In typical Roe fashion these all became marginally different as Roe did not jig build their bodies. Then we found the engine block had two cracks-one easily repaired and the other proved impossible. I sourced a Gen-set and my team rebuilt it to the Automotive Spec. YOU NEED OPTIMISM TO CARRY OUT RESTORATIONS. But all worth it when I see comments like Tony’s. Just a quick line to reinforce Tony`s comments on EKV 966. I had the pleasure of riding on her last Saturday at Quorn, and enjoyed the best ride I ever had on a preserved bus. Beautifully restored, and the sounds were pure "music" ! The last time I heard such "music" was 1958, when Bradford withdrew its last CWA6s. Thanks for the enjoyment Roger. Well done, Roger, for your tenacity, another quality needed for vehicle restoration! For those of us who won’t be able to see here in the flesh, How about a favourite photo of yours to put with this post? Where are you based I may bring it to a Bus Event near you? If you send me your email address I can fill your in-box. VV 8934 is a Daimler CWD6 with Duple Utility body and is seen in service during Coventry City Transport centenary event in May this year (2012). 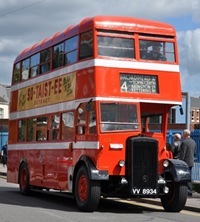 The vehicle was new to Northampton Transport in 1945 as fleet number 129. Restoration was completed in 2011 and I think this is the only Daimler with utility body left running. It is owned by a member of the Lincolnshire Vintage Vehicle Society and should be at their event in November. What about the Huddersfield one, masquerading as a London vehicle which is (was?) owned by Stephen Morris? The question is whether this is the only (rare) CWD6 in preservation: The London/Huddersfield CW is an A, I think. Huddersfield 217 (CCX 777) is indeed a CWA6. It too was new in 1945 and also carries a Duple body but of the lowbridge variety. It appears in Huddersfield, PMT and London Transport liveries on this posting. Probably the only preserved CWD6, but as well as the Huddersfield lowbridge example, there is, or was, a highbridge Duple CWA6 from Douglas Corporation in preservation. See the cover of Alan Townsin`s TPC book on utility buses. This is, to my mind, a handsome vehicle. This is what a bus should look like! A fantastically good restoration…all credit to those responsible who have done a superb job. I know absolutely nothing about these vehicles, but having driven RT’s and RML’s etc on LT, and LKH’s on E.C.O.C., this photo only makes me wish I could have driven one of these as well ! !—with pride…. Another Daimler CWD6 in preservation is Aberdeen Corporation 155. The bus currently resides at the Scottish Vintage Bus Museum at Lathalmond in Fife. 155 is now painted in the earlier livery of dark green and white. Magnificent, and to think that the modern equivalent will be in shades of pink and grey. YUK! Quick link to the OB Sounds page and it should take you directly to the clip. To confirm that CWD6 Northampton 129 will be in service at the LVVS Open Day on Sunday November 4th. Please see www.lvvs.org.uk for the list of vehicles in service. May be as many as 35. A great day out. John Child thought you maybe interested in this picture as a before and after shot pertaining to my shot above. The picture was taken by John at Molesworth in 1990 prior to restoration. Makes an interesting comparison to my shot don’t you think? 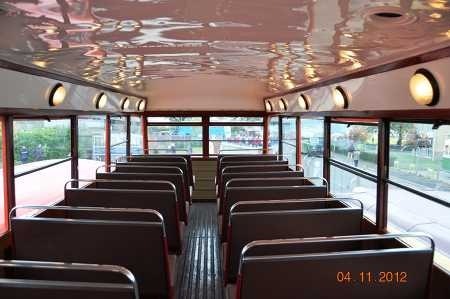 At Lincoln yesterday I was given access to photograph interior of VV 8934 without the crowds and a private trip round the block thanks to the owner John Childs and the crew of the vehicle. I was also at the LVVS do at Whisby Road, and rode upstairs on an almost full VV 8934. I imagined that progress would be fairly sedate, but thanks to the fine mechanical condition of this bus, matching its immaculate bodywork, and to the skill of the man in the cab, it positively flew along. Gearchanges and braking were wonderfully smooth and the sound effects a real delight. Thames Travel, based at Wallingford, Berks, who run a very good if tightly-timed service between Oxford and Reading, are just about to get rid of some MCV single deckers. It’s almost unbelievable that these tinny, bouncy, deafening vehicles with their cramped 27" seat spacing, are 6 decades newer than the magnificent Northampton Daimler. The standard of restoration and driving of every vehicle I rode on was very impressive, but their original design has hardly been improved on. I admit that heaters are better today and seats are wider, and that low floors and kneeling suspension now make buses available to all—a piece of real progress, that—but the overpowered engines, fierce brakes and inescapable din from air-circulating systems assault the senses from all sides. The LVVS day was like a return to sanity! Be careful Ian – the thought police will get you! S*d the thought police, Stephen, I’m with Ian. I agree entirely, Ian. Things to add to the "comforts" of modern bus travel are moulded plastic passenger seats, snatching retarders and howling differentials. Why are back axles so much noisier these days? All these, plus the noisy overrun on the engine when changing down when slowing! Can I dare to say that the whole design of modern buses is flawed: the rear engine is yards away from the driver, and gets abused by the driver’s lack of sensitivity at this distance, and by the remoteness of the controls. The weight at the rear seems to make them unmanageable in ice and snow. If you stand to leave, the braking pitches you forward, whereas it is safer to be pulled back. Why o Why, when passenger numbers are falling, do we go for megabuses all the time? They clog up lanes and streets. Just a few thoughts on why that Daimler doesn’t seem ridiculous at all. Bring back the Q! Joe, I entirely agree. The whole point of front entrance/rear engine seems to have been to facilitate one man operation. (The thought police will get ME for that!) But the effect was to give a thumping great bus the balance characteristics of a caravan. I recall a seasick-making journey from Ipswich to Hadleigh 30 years ago on an ECOC Bristol VR (by no means the worst offenders in the soggy suspension stakes). It was like a fairground white knuckle ride. Then also, using high capacity buses to reduce frequency while maintaining the appearance of service provision expressed as seats per hour makes the service less attractive, and for many people totally useless – and this when everyone is used to the infinite flexibility of getting into a car when they want to. Add to that the long delays at each stop while passengers fumble for their money or pass, and it is obvious why busy and impatient people regard the bus as transport of the last resort. I am a great fan of the continental "honesty" system for fare collection on city networks – passes or books of tickets bought at newsagents, and self-validated on board, with flying squads of inspectors charging about 25 times the standard fare for evasion. This removes time-consuming revenue collection from the driver and keeps the bus moving. It also cancels the need for a bus design with passenger access alongside the driver. (In other words, the wheels can revert to the front instead of being somewhere in the middle where they give the seesaw effect.) In some of our rougher cities it would be a positive advantage for the driver to be in his own secure cab, and not to be exposed to the verbal and physical abuse of the great unwashed public. Well, that should be good for a few rejoinders! Stephen there is much sense in what you say about fare collection although the dear "Public" are probably rather less honest than in Europe..well they used to be perhaps! I would make things even more simple..within city boundaries defined clearly, I would make all bus travel completely free. How?…we squander tens of millions on "surveys" and "planning" trying to make badly flawed ideas work here in Bristol. Just now £20M has been chucked away after scrapping plans for a "bendy bus" network that is now thought to be better if operated by..single deck buses 36" long…that’ll be a stroke of genius! So, rather than continue to fumble about any more, just make travel free and use the funds lost in trying to get people to catch the bus to make using one a VERY good idea. The operating costs being taken care of from Government funding currently set aside for a multitude of "solutions". Free things always work. Greater minds than mine on here will have a better understanding on how possible this is but it would be a big help if free say 6 – 9 am and 4-7pm..less cars, less pedal cycles ridden by madmen, less traffic hold ups and a younger passenger base becoming more used to buses than most of us older bods for whom the car is vastly preferable and who don’t fancy standing in the rain for ages waiting to ride home sat next to a loony with a cold! Now…anyone think the idea has..wheels?? I think the maths of the Continental honesty system goes like this : there will be some people who will never bother to get a ticket. OK, that doesn’t matter so long as they get caught about one journey in every 25 – because the fine will reimburse all the previous unpaid journeys. I can remember the first Atlanteans with the Northern General Group, I would have been about 14ish at the time, anyway, about two or three weeks after they came into service I was speaking to a friend of my Dads who was a driver, I asked him what he thought of them and he said he hated them, why? I asked, and he replied that as well as being an abortion to drive, as soon as you pull up at a stop and open the doors all you get is, where’s the bus in front, you’re early/late, do you, don’t you, what time, how long, is it, will it, wont it, what bus goes here, how do I get there, and after 20 odd years on buses he finally knew what conductors were moaning about. In the past, some British operators used to have honesty boxes on buses and trams. Glasgow was one, and, I think, Brighton Corporation. I wonder who supervised the emptying of these receptacles. One of the reasons why London Country (for one) discontinued the use of fareboxes was the opportunities they afforded for unauthorised access to the contents of the coin vaults by the designated removal staff during the small hours. Huddersfield Corporation/JOC also had honesty boxes certainly until the late 60’s. Of course, inspectors are few and far between nowadays, too, although one did get on my bus the other day and did his stuff thoroughly. As for abroad, I do recall, about 8 years ago, travelling on a Lille tram and, at one point notably as we stopped at a college/Uni, a hoard of traffic staff blocking the tram doorways and checking for evidence of valid travel for those descending (mainly students), several offenders being caught. Then, a couple stayed aboard to the next stop, checking the remainder of passengers and catching about four more. I recall they caught quite a few offenders! There were no honesty boxes, but it’s doubtful if they’d have worked there! I am by no means certain but I think Huddersfield’s honesty boxes ceased to be fitted to new buses in 1967 with the arrival of the first Fleetlines but as far as I can remember those already fitted stayed with the bus until it was withdrawn. Perhaps someone who remembers the Huddersfield PD3A’s in service with OK can tell us if they were still fitted then? Nottingham City Transport had them too – though I don’t ever remember seeing anyone put anything in them. I guess the thought was "If the conductor hasn’t collected the fare by the time I reach the platform to get off – tough!" Grimsby-Cleethorpes used them, the only time I ever saw them being used was when my driver inadvertently left me at Riby Square and I had to be taken to the bus by patrol van. I look forward to conducting Northampton Daimler 129 again on the LVVS spring running day Sunday 16th April 2017. The owner is a Mr. John Child and all tickets issued are Child tickets for obvious reasons. One little known fact about the war time utility buses is that they do not have a conductor platform repeater bell. When the motor is running the conductor cannot hear the bell ring in the drivers cab so he has to give the thumbs up to indicate he heard the bell. Northampton Corporation never got around to installing a bell post war. It is a joy to conduct this bus which is in first class condition. No, it is not the only CWD in preservation. Aberdeen 155 (BRS37) is a 1945 example, fully restored at SVBM at Lathalmond, near Dunfermline. As a kid growing up in Northampton with relatives working on the buses I achieved a goal of every bus in service. That included fleet # 129. I’ve looked at the website several times, and made a few comments. I’ve decided to offer a few of my colour slides for inclusion in the forums. Sadly, the black and white prints I once had (taken on a 2s 6d camera bought from Woolworths in 1962) were not of suitable quality for publication and have long gone. 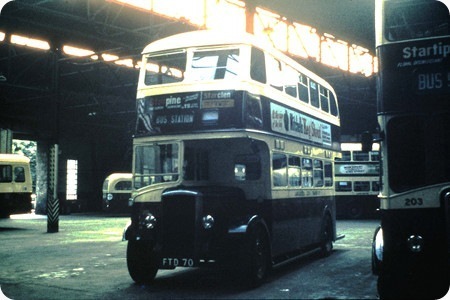 My first offering is the Lancaster City Transport Daimler CW, FTD70, captured inside Kingsway Garage on a Saturday afternoon in August 1969. She had been given a 1952 Crossley body to replace her original "Utility" feature. As with many of the fleet at the time, she carried adverts for cough medicine, dishwashing and similar products from the makers of ZOFLORA. Compared to its near neighbour Morecambe Lancaster had a very mixed fleet of Daimlers, Crossley, Guys, Titans, AEC saloons and later Leopards and Panthers. Having a fleet of less than 100 buses the numbering system was also unusual the fleet number being the registration number thus buses were numbered in the 800s ! I knew the fleet well in the seventies when they had amalgamated with Morecambe whose main fleet bus was a collection of elderly AEC Regent IIIs. In an effort to withdraw these the undertaking bought many second hand buses including a lowbridge Atlantean from Trent a Wallace Arnold coach Burnley PD3s and some Maidstone PD2s which retained their former livery. They were even brave enough to buy a Seddon Pennine demonstrator! A company that is much missed, even today Stagecoach still use second hand buses on local routes, Plus d’change! A very atmospheric garage shot Pete – you can almost hear the echoey sound of buses being started up in the distance. Hard to believe that the chassis would have been twenty-six years old at the time. Not bad for a "wartime stop-gap", and the Gardner 6LW would have been nicely run-in by then as well! The Crossley body looks to be in tidy fettle too if the shine of the paintwork is anything to go by. It looks quite handsome, and certainly less dated than the ‘traditional’ Crossley style, with its strange shallow windows over each rear wheelarch. Does anyone know if the latter feature was just a Crossley styling quirk, or was it of structural necessity? I’ve often wondered. Is this a Crossley body, without the raised section over the rear wheel arches? Then there’s all those vents, at lower sides and upper front…and it really does look like a half-width front saloon window? Why? Are we sure that this is a G6 and not at that vintage an A6? Or even just possibly a D6? Questions, questions…. My mistake here, it is actually a Gardner 5 not a 6 glad you raised the question Joe, I have corrected the header, sorry about that. I assume, Chris, that when you say ‘ex-Maidstone PD2s’, you mean ex-Maidstone & District and not ex-Maidstone Corporation. You say they retained their original livery, and the corporation’s brown and cream would have stood out rather. Interestingly, (to me, any way), John Stringer points out that Calderdale JOC also retained M&D’s livery on some second hand AEC Regent Vs. Old and faded though the paintwork might have been by the time M&D sold their old vehicles, the fact that other operators felt able to retain it, even temporarily, says something for its durability and the quality of M&D’s maintenance. Incidentally, were the PD2s in question of 1954 vintage, (RKP registration marks), fitted with Orion bodies? Roy, in answer to your query about the Maidstone element, they were most definitely Maidstone Corporation, which were in a pale blue by then. I have several photographed on duty in Morecambe. Following Lancaster’s practice of the time, 998 AKT became Lancaster’s 998! Joe, yes the official records show it as a Crossley body it was rebodied in 1950 (OBP Lancaster Fleet List) or 1952 (BBF Lancs Municipals) the original body was a Massey H56R. The strange half depth windows towards the rear of many such vehicles were, I believe, a Manchester feature. They were Maidstone Corporation PD2s but by then the brown and cream livery had been replaced by a light blue one. This Crossley body is of the later style without the shallower windows at the rear. These originated with the Manchester practice of cutting the chassis frame short immediately after the rear axle and cantilevering the platform from the body structure, the idea being to prevent chassis distortion (expensive to repair) in rear end accidents. This was not adopted by other operators (and I think even dropped by Manchester) so the body style eventually reverted to this more conventional outline. 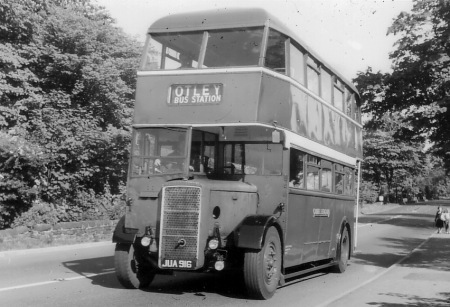 Probably the nearest relatives of this later Crossley style were the 13 trolleybuses of Bradford Corporation, which were rebodied by Crossley, and entered service in early 1952. The chassis were of 1938/9 AEC 661T, and Karrier E4 origin, and very handsome vehicles they were too! Lancaster was a fleet of great interest. It had many Crossleys of more obvious, and earlier parentage, and wartime Guys rebodied with Guy/Park Royal bodies…plenty of enthusiasm generating influences, and a super fleet I well remember, mostly on visits to "Bradford by the Sea" (Morecambe!). Thanks, Pete and David, for putting me right on Maidstone Corporation. I’d forgotten about the livery change, which was a bit after my time. I was also wrong footed by the reference to Morecambe, thinking of green. The vehicles in question would have been 1957 tin fronts with Massey H61R bodies. We, (we being M&D staff), always thought Massey bodies an unlikely choice by Maidstone Corporation, but no doubt they had their reasons. David B, Thank for your comment about the large interior notice board. I’d quite forgotten them as the reason for the smaller windows. Perhaps, after over 40 years in Hampshire, I can be forgiven! There was a venture, shortly before I moved south, to have adverts in those spaces: some were illuminated, but I certainly don’t recall the earlier notices. Some operators had a similar board at the back of the lower saloon, on the staircase panel, and it housed the timetable and fare charts. I had very little in the way of dealings with Morecambe & Heysham buses, but they had that arrangement. I wonder if Lancaster’s ever had that function. Incidentally, I had a classmate with the same surname, in my primary school days. Did you go to Ryelands??? There is a shot of a Maidstone Titan working in Morecambe at www.sct61.org.uk there are also shots of other second hand vehicles bought by Lancaster at the same site. Some buses bought as driver trainers also ended up on service including a former Merthyr PD3 and a Southdown "Queen Mary" The former Lancaster depot still exists as up market flats called the old bus depot the parking area being the old depot with the flats added on top. After amalgamation the new undertaking bought the only Y type bus bodies (with small windows) south of the border. However the planned panoramic Alexander bodied Leyland Atlanteans never materialised. David, thank you for the interesting information about the cantilevered platforms on the Manchester Crossley bodies. Fascinating, although one can’t help wondering why Manchester had such a fixation on severe rear-end damage being inflicted on its buses. The modified structure must surely have been more expensive to have had installed ‘just in case’. Or are Mancunian drivers more prone to running into the back of double-deckers than in other places? We should be told…..! Brendan, the driving habits of car drivers in the Manchester area should indeed be publicised more. I have seen CCTV footage of a car which had been impaled after the driver tried to ignore a set of rising bollards installed to regulate a bus lane . . . 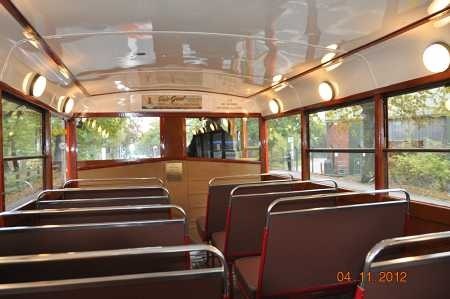 The Crossley style body on the Lancaster Daimler CWG5 is similar to those that Bradford had on a few AEC 661T and Karrier E4 trolleybuses and received in 1952. These 13 re-bodies were well finished and introduced a new image of trolleybus in Bradford. Sadly Bradford did not re-body any of their utility motor buses and had 6 Daimler CWG5s (468 -473) similar to Lancaster which they were disposed of in 1953. A photo of Bradford AEC 640 and Karrier 682 at Thornbury re-entering service again in March 1952 shows the lovely Crossley body style. I note that John Whitaker comments on his encounters with Lancaster’s buses during his visits to "Bradford By The Sea". That isn’t quite what some of my classmates in the Sixth Form at Morecambe Grammar School used to call the place. Their usual reference was to "British West Bradford". Apart from the University services, which Lancaster City Transport and Morecambe & Heysham Corporation Transport operated in conjunction with Ribble, the fleets never met until after Local Government Reorganisation in 1974, and not immediately even so. David B – I’m a little confused by your comment that no operators, other than Manchester, took Crossley-bodied vehicles with shallow rear windows. Both Portsmouth and Luton Corporations had them, to my certain knowledge. Is it that other operators took them with the shallow windows, but not with the cantilevered platforms? Could you clarify, please? The Crossley-bodied trolleybus is very handsome, Richard F, and it’s interesting to note the flared side skirting, a la post-war Weymann. Ashton also rebodied many of their wartime Guys with the same style of Crossley body. The link was even closer, though, as Lancaster had one Guy Arab which was rebodied by Crossley registered FTE 182 and Ashton had a batch of four registered FTE 183-6. Whilst the method of allocation of buses in wartime made the appearance of consecutive registrations in different fleets more likely, that they should then receive virtually identical bodies when rebodied is quite remarkable. I don’t think the cantilevered rear platform was all that unusual. "The Manchester Bus" (Eyre and Heaps) records that Manchester got the idea from an inspection of a borrowed early production London RT. This presumably means it was a feature of all RTs, but less obvious because London didn’t see the need to strengthen the structure in a way that showed itself visually. Something else that isn’t widely known is that the entire body, not just the cantilever platform, was designed by Manchester Corporation and not Crossley. It’s rather remarkable in my opinion that Crossley could end up with such a handsome product by simply taking Manchester’s design and stripping it of its most Mancunian features. Similar bodies, but with a Liverpool-inspired flat front, were fitted to 50 AEC Regent IIIs for Glasgow Corporation. Thank You, Richard, for the Bradford Crossley trolleybus submissions, which illustrate my point about what handsome vehicles they were. Chacely T. Humpidge, that champion of the trolleybus, had just been appointed, and he used these rebodies as a statement of intent for his new, neat, clean cut image, and distinctive identity with regard to destination display, which followed on into the later "East Lancs" period. I found the Lancaster and Morecambe thread to be of particular interest, but, as I seem to be a relic from an earlier age, my recollections are of the Morecambe pre-war fleet, and the subsequent period to about 1950, when Morecambe, or "British West Bradford" was a thriving resort. I do, however, seem to remember at least one of the Maidstone Masseys running in the ginger livery at a much later visit to the town, but memories are prone to trickery. A pity though, about Morecambe. A visit last year showed that it is far from the place it used to be, but then, that applies to many other places too. Better to remember the heyday; green AEC Regents on the promenade with customers galore amongst the holidaymakers! Many operators bought all Crossley deckers in the early postwar period most of which had Manchester style bodywork. This was available with either straight or drooping corners to the upper deck bodywork. Crossley also built bodies on other chassis most notably a batch of Guy Arab IIIs for Blackburn. The last all Crossley deckers were bought by Rotherham and were very attractive beasts. One of these survives in the Science Museum large exhibits collection. This CWG5 is a rare bird, for only 100 were ever built, after which they became CWA6’s, with AEC’s 7.7 litre engines, apart from a few at the end of the war which became CWD6’s with Daimler’s own engine. Re. the CWG5. This was more of a COG5, with ferrous metals replacing the lightweight alloys, and probably using some pre-war stock of parts, whereas the CWA6 was more of a re-design, with a new radiator. Of the 100 CWG5s, 40 were built with Brush lowbridge bodies, and 30 each in highbridge form, by Duple and Massey. The CWG5 was the wartime version of the COG5. It had the same wheelbase measurements as the COG but used cast iron parts in place of aluminium alloy parts and also had a Kirkstall Forge rear axle. The Gardner 5LW engine was flexibly mounted so with a fluid flywheel and Wilson pre-selector gearbox, this bus was perhaps the most refined of the utility buses available when it appeared in December 1942. No doubt Lancaster Corporation recognised this fact with their re-body programme. Sadly other operators such as Bradford Corporation disposed of their six CWG5s (468 – 473) in 1953 to scrap dealers Rhodes of Nottingham. Perhaps the steep hills in Bradford were a deciding factor to get rid of them. 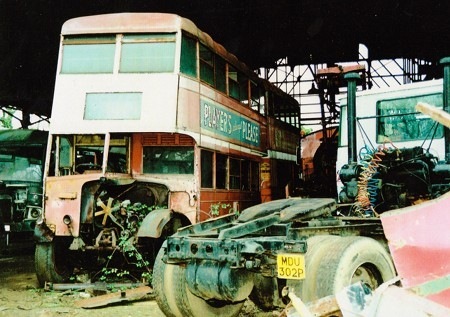 It would be interesting to know how many of the 100 CWG5s built were re-bodied for further service. Chris H , you’ve renewed happy memories for me there. Samuel Ledgard’s final allocation of "Utility" buses consisted of eight Daimler CWA6/Duple – or did it ?? Well no – two of them were CWD6s, both of which were allocated to Otley Depot throughout their existence. My word what a fine pair of machines they were, and not only because the Duple bodies were very sound indeed and rarely needed any serious attention, and no rebuilding to speak of. Even now I daren’t put in print the power and the speed that JUB 647/8 could display – suffice it to say that the legal lettering "speed 30mph" was a joke !! 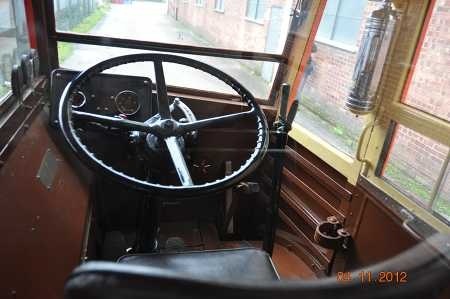 Also the melodious hum of the Daimler engines was a real joy, and in Winter the offside exhaust manifold provided fabulous heat – in Summer too, but no problem as cab windows could be opened. You were lucky to get a couple, Chris Y, for only a dozen of the Duple batch you mention were CWD6’s. Aside from the reversed exhaust system which warmed the cab unintentionally, the engines also had the timing chain at the rear of the engine, a nuisance to get at for retensioning/replacement. I don’t know whether LT replaced the engines with reconditioned ex-STL AEC 7.7’s for these reasons, or to achieve complete standardisation. You could always tell the CWD’s for they had vertical rods down the rad instead of the grill. I always remember one CWD having ‘D?? ?, the fastest D of all’ written in chalk above the windscreen. The ‘D’s were excellent vehicles and many went to Ceylon in their after-life. How the somewhat suspect bodies stood up to the humidity, I’ve no idea, but they lasted some years, even into the slow demise of the bus system there. LT’s Guys, conversely, gravitated towards Jugoslavia. As an aside, a friend of mine had a Renault 16, whose engine was designed originally for a rear-engined car , but fitted at the front of this model. The timing chain, thus became inconveniently situated at the back of the engine. When his timing chain failed, his solution was to cut a hole in the car’s bulkhead, sort out the problem, then pop-rivet a plate over the hole! It saved pulling out the engine with all that that entailed! How many CWD6’s were built? Were the dozen that Chris H mentions, the remaining production additional to LT’s Daimlers and for provincial operators, or was it just a dozen with Duple bodies? Ledgard had two, Trent had two, but theirs had Brush bodies, is it known who had the remainder? Chris H…at the risk of thread drift wrath, your memories of working on the (excellent) Renault 16 are a sharp recollection for me. If you had never removed the rocker box cover before, my challenge was 30 minutes to to simply take it off and put it back on again! With experience and knowing that you start by undoing the gearbox linkage down at the off side front corner of the engine compartment, I got it down to a three minute job! Simply getting it back onto the cylinder head required the finger dexterity of a surgeon and the problem solving skills of a MENSA crossword compiler…but once learnt..Ahh the satisfaction! I am assisting with "thread drift" again, Chris, as I was interested in your comments about disposal of London buses. Yugoslavia saw the arrival of some 16 Guys, plus the 65 post war STDs and G436, but many Guys went to Kenya, and the former Southern Rhodesia, and, of course, all over the UK, with significant numbers to the Scottish Bus Group. I think you have hit the nail on the head with CWD6 deliveries, Chris, as the only additions I can suggest, and I am not sure, were a batch of Newcastle buses with post war style Massey bodies, but were there any more with utility bodies, before the Daimler engine went into the CVD6? I would love to know! A very "thirsty" engine, according to Bradford staff, but one of the silkiest and smoothest bus rides I can remember, from experience of Bradfords 2 batches. I think these remarks about the Daimler engine are neatly timed with David Page’s recently posted recording of the Gash CVD6: smooth, helped by the preselector changes. Is this the best bus of all? (ducks). I wonder, though, if the aristocratic fuel consumption has anything to do with the quantity deposited all over the exterior of the engine & the ground beneath: I think it was fuel, not lubricating oil: after all, part of the thrill of a CVD6 was the smell! I’ve been checking Alan Townsin`s book, and the Newcastle JVK Daimlers were CWA6, but the paragraph seems to suggest that identical buses for Rochdale, still delivered under the MOWT arrangement, were CWD6. Leeds had 2 batches of CWD6 though, JUB596-8 (Brush utility), and JUM 571-6, (Roe). I think I remember a ride on Sammie`s JUB 647, complete with platform doors, on a Bradford to Menston journey. It was certainly a "flyer" if memory serves me right! Most of my Ledgard "CW" memories are HGFs though, but it would be nice to think that on the Menston occasion referred to, our captain and pilot was Chris Y! Trouble is, I cannot remember when it was…too many senior moments these days! I have this mental imagery of a cotton coated conductor, bracing himself against the stair well at the upper deck rear, as the bus hurtled down "The Branch". perhaps that was you, Chris!! Exeter GFJ 82,83 (Brush), and Birmingham FOP 420 etc. Keep looking…between us we shall collar the lot! Of course, much of this CWD aspect revolves around when CWD to CVD production changed, for Daimler didn’t offer any engine, other than their CD engine, for some time afterwards, if memory serves me correctly. After a quick look, the earliest CVD’s I can trace were 60 for Venture of Consett between 1946 and 1948, the first still with painted steel rads! Hi John W – a most interesting trip you had on 647, but sadly I can’t claim to be the driver or the conductor. As I said above, JUB 647/8 were at Otley Depot throughout their existence and should not therefore have been seen on the Bradford – Harrogate service. So, you were able to enjoy a real "one off " journey on that occasion as 647 must have been changed over in Otley or nearby to replace a defective Bradford Depot vehicle. I would love to have been with you as I’m sure the Daimler will have flown up the long and tortuous Hollins Hill like no other, in spite of the extra 3 hundredweights imposed by the retro fitted platform doors !! Incidentally the Bradford – Harrogate service (Ledgard’s longest) was referred to even officially to the end as "The B & B" – having been taken over from Blyth and Berwick before WW2 – and despite having being renamed after Samuel’s death in 1952 as "S.Ledgard (Bradford) Ltd."
The only involvement Otley Depot had with the route consisted of one morning and one evening peak hour extra, Mondays to Fridays, between Otley and Menston Village – and these were shown in the timetable as "Operated for the convenience of workpeople and liable to suspension if not required." Another happy memory – JUB 647 was the first preselector bus that I drove in service on the fourth day of my career as a driver in 1961 – 06:40 am Otley to Leeds on Monday, and the powerful rapid ascent of the three mile long A660 from Otley thrilled me, as had the gorgeous refined hum I’d enjoyed previously when conducting this fine motor. My "647" memory could well be distorted; It must have been late 1960, and I was going to Pool in Wharfedale to view my first car purchase there, a 1936 Austin "Ruby". I am sure it was a Duple with doors, so were there any others? My return journey was again with Sammy, this time a single deck Albion! If only we could replay our memories! To round off the Lancaster CWG5 theme, and having wandered off to London Guys world wide disposals, it is perhaps apt to recall that 4 of these Gs were bought by Lancaster in 1953! Ah John – I think that perhaps solves the mystery. It is just possible that JUB 647 might have done the odd hour on the route in the event, as I mentioned above, of a changeover but is a one in a million chance. It was, however, quite common for Daimlers with "retro fitted in house" doors to operate on the long route. Most likely it would be one or other of the ex London Transport Sutton Depot "HGF"s with Park Royal "relaxed specification" bodies – in profile these loosely resembled the Duple outline. The only other possibility – a very strong one – could be JUA 918, one of four received in the dark days of the War, but with unmistakeable Roe body. Originally wooden seated, JUA 918 was superbly overhauled and was fitted with platform doors and, I believe, ex Midland Red very comfortable seats with "M"shaped tops to the backrests. In that form it spent much of its time on the "B & B" and was a magnificent vehicle – the 7.7 AEC engine was always in top form and performed impressively. However if, on your ride, you had the impression of "Duple" I imagine it would be one of the "Sutton HGFs" – better not get me going there, as I worshipped those and the Firm had twenty two of them, several fitted with doors in keeping with the post 1952 policy of the Executors of improving the image and putting WW2 firmly behind us. I , too, loved the HGFs I also remember JUA 918 as a regular on Bradford-Harrogate. Probably as you say, an HGF, as I recall the "Roeness" of JUA 918, and feel sure my memory would be more accurate if that were the case. I loved Ledgard in this period particularly, as our beloved WYRC Co. had become very standardised , and the enthusiast in me craved for more interest and variation. You certainly got that with Sammy! Funny that the other JUAs were not similarly overhauled, as the earlier Roe utility bodies were exceptionally sound, or so I was led to believe. None of your Pickering qualities here! Another favourite Ledgard Daimler which I always sought out, was GYL 291, the only Brush member of the Daimler CW fleet. What a wealth of memories, and how on earth are todays younger enthusiasts going to have such rich flash backs, when they are my age, with the present scene as it is! John, yes indeed the Roe utility bodies were sound and trouble free as were the Duples. The four "JUA"s and the two Pickering Guys were Ledgard’s first taste of WW2 wooden seat double deck austerity. As you rightly say, the overhaul of 918 was the most spectacular and 915/7 toiled away unspectacularly at Armley depot, while 916 was at Otley throughout its existence. After a most unusual, unique even,long period out of use but stored inside the back of the depot – such buses were normally kept outside, or inside at Ilkley "running shed" – 916 was again prepared for C of F to the usual impeccable standard displayed by the craftsmen of every speciality. For the first time ever a platform repeater bell was installed, encased in a metal box to prevent tampering – and tampering there would definitely have been, for this infernal but well meant device emitted sufficient decibels (no pun intended) to call out every fire brigade within five miles, well, four miles perhaps !! Upon emerging from the process, with commendably long C of F for such an elderly utility bus, 916 gave many more years superb front line service and could maintain the busiest schedules without difficulty. I too fondly remember the two second hand "one off" CWA6s at Armley depot – GYL 291 (Brush) and HGF 805 (Duple) – but with the greatest admiration of all the twenty two Sutton depot "HGF"s, the undoubted saviours of the Firm in the dark days of the mid 1950s when the difficulties remaining from WW2 and the Death duties following Samuel Ledgard’s death in 1952 surely almost brought the Firm down. One of my favourite pictures here of JUA 916 after its spectacular return to the front line, on a lovely day at Bramhope Church – the vehicle by now 16 years old, who would think it. Picture by the late Robert F. Mack to his usual splendid standards. Many thanks, Chris Y., for the wonderful photo of 916, and all the superb Ledgard memories your responses have generated for me! It really was a truly wonderful fleet, both from the enthusiast viewpoint, but also in terms of a very well run business, which was sadly missed when it disappeared in 1967. I am always surprised when I am reminded how "fragile" the company was in the early years of the "Executors", as Samuel was a very astute, as well as straight talking Yorkshireman, and I just wonder sometimes how it came to be that his astuteness did not fully extend to his thoughts of his own demise! Perhaps there was nothing more he could do in his final years. As well as the early "exec" period, which was a delight, the earlier period presented a very "corporate" image, with those batches of pre-1950 Leylands, complete with all the "UA and UBness" of Leeds registrations, punctuated by the occasional"AK/KYness" of my native Bradford! I have just resolved some pressing computer problems, and now I have the time, I find I cannot put down my "Beer and Blue Buses" book! I’m delighted to see the photo of JUA 916, Chris Y – I can almost imagine myself aboard now – very evocative! It’s the first time I’ve ever seen a Roe utility body, as you say, looking very ‘fit’ for its age. Was the body much modified by this time? The front actually seems to have a curve upstairs and possesses neither drop side windows nor front opening ones. The headlamps are certainly lower than the ‘norm’ I’m used to. Also, the front upper part of the bulkhead. looks as if it’s been pop-rivetted one – a little odd. Roe built very few, if any, highbridge motorbus utility bodies after this time, concentrating on lowbridge Guys, but they did build this style for several fleets, including Doncaster, and the rebodied South Shields war damaged Daimler trolleybus. They returned to highbridge bodies in 1945, with the W4 trolleybus contract, to a squarer style. Bradford 703 – 714 refer. East Yorkshire had a batch of wartime Arabs with similar bodies to the "JUA"s, but adapted to Beverley Bar shape, where the existing arched roof dome proved advantageous. Roe utility bodies seemed to enjoy longevity, but they would, wouldn’t they! BCT 703-714/734-739 were the last to be taken out of service for rebodying, withdrawal preference being given to the Park Royals. Roe always took some beating! I just wish that the Crossgates Carriage Works were still producing such quality vehicles! The complete list of Roe highbridge utility bodies on Daimler CWA6 is: Trent 8, Ledgard 4, Northampton 4, Kippax 1, Felix, Hatfield 1, Ebor, Mansfield 1. Total 19. There were three other highbridge utilities, A Regent for Doncaster and Leyland TD7’s, 1 for Yorkshire Traction and 1 for Yorkshire Woollen. Sadly John, the magnificent Crossgates Carriage Works – and the lovely office building where all brand new vehicles were photographed – has recently been demolished and Optare are now at Sherburn in Elmet. Daimler Drive……… and so forth. Chris, How about "Renown Avenue"…a postal address I would be proud of! When tram riding in Leeds, we always tended to gravitate as near as possible to Crossgates, to inspect what delights may be on view! John W and myself made many pilgrimage visits by tram to Crossgates Carriage Works to pay homage to our favourite bus builder Charles H Roe. I think the best outcome of this sad news of the works demolition would be the street names suggested by Chris Y and John for the new re-development of the site for houses. Roe built quality bus and trolleybus bodies and will never be forgotten for their belief in teak frames and the patent waistrail. The solitary highbridge utility Roe bodied TD7 for YWD was HD7286 fleet number 480. It sustained serious damage in a lowbridge accident on the outskirts of Huddersfield in 1949 but such was the quality of the Roe bodywork that it was repaired and put back into service. One wonders if these early utilities (1942) may have been built from pre-war seasoned timber the bodybuilders carried in stock, rather than the unseasoned timber they had to contend with later. Thanks, Chris B, for that interesting and informative breakdown of the Roe highbridge utility bodies. It is a great feature of this site, that we can learn such detail from each other. I think there were 2 rebodies as well, the S.Shields Daimler trolleybus, CWK 67, and the Grimsby 1931 Regent, EE 9860, which was the Roe prototype centre entrance bus, which was also war damaged. I think I am correct in saying that Roe lowbridge utility bodies were only built on Guy chassis, but I am not certain, and am wondering also, if any Mark 1 Arabs were involved. There is a major misconception in this thread regarding the Crossley built stepped window design and cantilever platforms. The design is actually a Metro Cammell design for Manchester and was patented as such. Over 700 bodies were produced to this design for Manchester and, as Metro Cammell could not meet all the orders, their production was on Leyland PD1 and PD2 chassis. Crossley provided the bodies on their own chassis as well as on some Daimlers and Brush built a number on the other half of the same Daimler batch. Crossley adopted the design for its own product range (with or without cantilevered platforms, depending on the operator) and paid Metro Cammell a license fee for each vehicle built, thus an "all Crossley" bus of the late 1940s/early 1950s had a license built body and a licensed (or pirated, depending on how you view the Saurer saga) power plant. All vehicles so built had a manufacturer’s plate stating that the body was built by Crossley under MC patents. Crossley built the design on their own, Leyland and Guy chassis for a range of municipal operators around the country. Of course I should have included Daimler to the list of chassis bodied by Crossley. Some other observations. The design was known by Manchester as the post war Standard, as opposed to the Standard of the pre Streamliner era in the 1930s. The drooped front windows were a direct link to the Streamliners. I assume that, when Crossley built bodies without the droops, and later without the stepped windows, they still were licensed built bodies as the basic framing was the same. Manchester took just one batch of PD1s with 7’6" bodies from MC, everything else was 8′ wide. Crossley offered both widths throughout the period it built the body style and successfully rebodied a number of wartime austerity Guy Arabs as late as the mid 1950s, as well as adapting the body for 8′ wide trolleybus chassis. The comprehensive "Crossley" book by Eyre, Heaps and Townsin does not endorse the view that the Crossley body was a Metro Cammell design, though it does state that bodies of the same design were built by Metro Cammell and Brush. Several of the features of the post war Crossley body arose from a detailed study of the revolutionary body of the London RT, and the early drawings even show the fairing of the nearside wing into the body structure in classic RT style, though production did not embrace this feature. Insofar as the HOE7 engine is concerned, the prototype unit fitted to GNE 247 did incorporate Saurer principles in the toroidal piston cavity and four valve per cylinder head, but Arthur Hubble of Crossley refused to cough up the licence fee demanded by Saurer. Production HOE7 engines had a hurriedly redesigned cylinder head incorporating two valves per cylinder and a curious piston cavity of concentric ridges, and the engine was a dismal failure that contributed fundamentally to the demise of the company. There were no Saurer elements in the HOE7, and the prototype engine was withdrawn and scrapped after the difference with Saurer over a licence fee. Roger I take your point re the Saurer principles, having re-read the story of the HOE7, however the book is as vague as Eyer and Heaps "The Manchester Bus" in regard to the "ownership" of the Standard body design. What "The Manchester Bus" says is that "Crossley adopted the design for its own production"
I was brought up in Manchester from the late 1940s and spent a great deal of my youth riding these vehicles and spending time around the depots. Later in life I had access to the MCTD records. The Streamliner of the 1930s was designed by Metro Cammell (Manchester’s preferred builder) and the MCTD Car Works. Bodies by Crossley and English Electric were badged as licence built. When Stuart Pilcher instigated the post war Standard, MCTD again turned to the Birmingham based builder. The body outline and the cantilever platform were designed in co-operation between Metro Cammell and the Car Works. 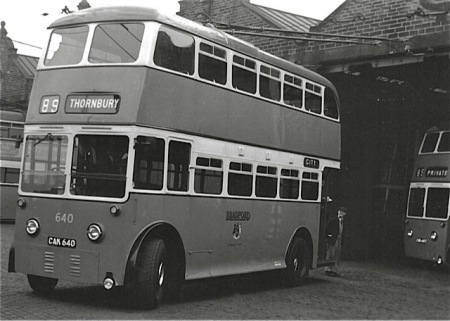 "The Manchester Bus" states, on page 149, "In May 1945 Titan 1396 went into the Car Works to have its rear end reconstructed using Metro Cammell’s bearerless cantilevered platform system which was then adopted for Manchester’s post war Standard body design". This chimes with my belief of the last 50 odd years and my reading in the archives 30 odd years ago, that the post war Standard was essentially a Car Works/MC design. Crossley actually built the first vehicles to the design due to order congestion at Metro Cammell and used their own frames to fit the outline but all the evidence I’ve seen shows the patent remained with Metro Cammell. Post-war Crossley body badges made no reference to Metro-Cammell and almost certainly didn’t include any of their patents. I’ve always considered that one of the main aspects covered by patent was the pillar section used by Metro-Cammell, which was formed hollow section steel. The Crossley frame was quite different, formed from two angle sections with a zig-zag section spot-welded between. I don’t know if there were any patents relating to the cantilevered platform, as the feature was first used on the pre-war RT which was not built by Metro-Cammell. I would expect any patents to be related to detail design and thus not related to the principle. I’m not sure that any Crossleys built for other operators featured the cantilever platform. Oldham 368 most certainly does not and yet has the shallow windows at the rear of each deck. "The Manchester Bus" describes the postwar standard as "the fourth of Stuart Pilcher’s designs" (page 153), and only acknowledges Metro-Cammell involvement in respect of the framing that supported the cantilever platform. Certainly during the time I worked for MCTD in the 1960s we believed the design was ours. At least we agree that it wasn’t Crossleys, something I have been trying to convince people about for the last 20 years! Peter: You are correct, the conception of the design had nothing to do with Crossley. It was put together in the Piccadilly drawing office in co-operation with Metro-Cammell. Manufacturers assiduously protect their innovations and the Park Royal design of cantilevered platform for the RT was so protected, leading to Metro Cammell and MCTD coming up with their method of cantilevering that led to the step windows. David: Crossley could not have used the overall design as their own without the agreement of both MC and MCTD and it is my belief from my readings in the archives in the 1980s that the design was patent protected and Crossley had to pay royalties. As to badges, my memory may well be at fault but I have a memory of a MCTD post war Standard all Crossley with such a badge. On the question of patents and how manufacturers protect not just detail design but overall concepts, and as we all keep referring to Messrs Eyres and Heaps publications, see p230 of The Manchester Bus. Manchester had designed its own airport coaches which were in outline similar to London Transport’s AEC Regal coaches bodied by Park Royal for BEA. MCTD had to pay a small royalty to LT as they had infringed the latter’s registered design for a high roof airport coach. Apart from my memory of reading the archives, I can’t see either Stuart Pilcher or Albert Neal, let alone the ever eagle eyed and cost conscious Transport Committee, letting Crossley have the post war Standard overall design for nothing. As to whether Crossley used the cantilevered platform, later versions of the body, such as Stockport’s last batch of DD42s, or Reading’s, did away with the stepped windows and probably didn’t have cantilevered platforms. You cite Oldham 368 which, like a batch delivered to Stockport, has the stepped windows but no drooped corner front windows and I accept your knowledge regarding that vehicle’s lack of a cantilevered platform. But ask yourself this: why would a company, however it was able to use someone else’s design, keep the otherwise useless stepped windows on vehicles delivered to a range of operators over a period of 4 or 5 years if a cantilevered platform wasn’t specified?